Watching the episode was both interesting and a little unnerving. It was hairy watching it from an outsider's perspective, but when you're in it knee deep, it's different. You just kinda go with the flow and be thankful that you have something that's not gonna off you today or tomorrow. So now that we're here and hanging with our families and friends and loved ones, lets laugh as much as possible and enjoy every minute of bonus time given to us. P.S. See, no pred rage rant today. Ha ha ha. In Season 1, the episode "DNR" also references Wegener's. In that episode, WG was also an incorrect diagnosis. It seems sort of ironic. 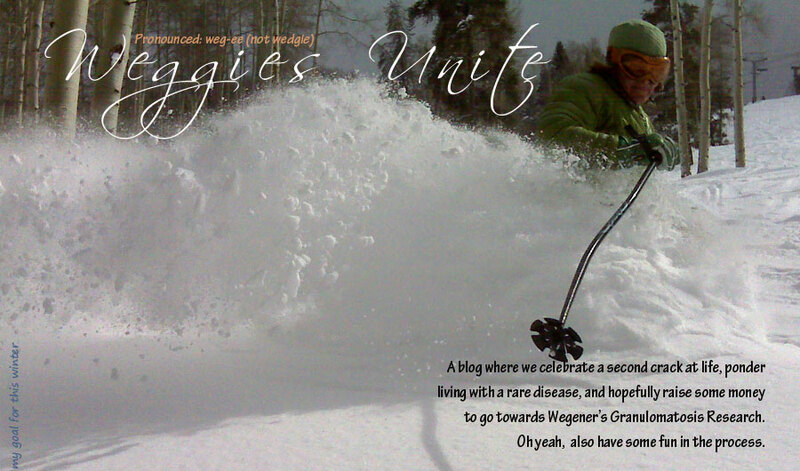 Usually it is WG that is misdiagnosed as something more common, rather than the other way around! Hey Mike, I'll keep waiting - it's not like I have anything better to do at midnight - ha ha. Hey I've been thinking about you and wondering if you'd be into adding your story to the book project? I read your story on the Vasculitis Site and I love it. It's inspirational and I think we need stuff like that in our Weggie Book;) If you are, send me a post with your email in it and I'll contact you directly (I won't publish it of course). Thanks and I look forward to hearing from you. No worries if you're not into it, I know some people are more private than me. I have no problem talking about anything, kinda odd actually. Have a great day.